The punishing heat of the long Australian summer has given way to a cooler slant of sunshine, punctuated by downpours in Sydney, NSW, but nothing that could stop the crowds of tourists from hopping between the cafes around Darling Harbour. 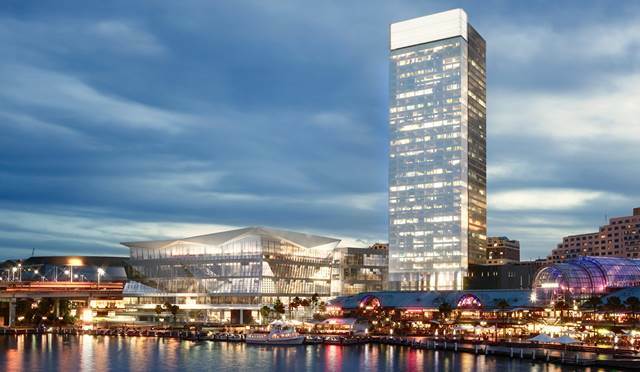 Darling Harbour, if you don’t know it, is right under the bridge, just along from the more flashy Opera House, and is home to the aquarium, IMAX – and a new International Conference Centre, due to open in December 2016. We’ve been to plenty of the world’s conference centres, and the things we look for aren’t necessarily what the venues highlight on their websites. We want to know: does the wifi work? Will the venue manager panic when we say we want to plug a Mac into the projector? And how easy is it to get to? Location is everything to the conference venue. In these times of ecological concern, a few hundred delegates catching a plane can put a dent in the most robust claims of carbon neutrality. It doesn’t matter how often you reuse your hotel bath towel, if you’ve missed out a carbon efficiency somewhere else, the carbon tally can soon add up. Venues work well when they are at a hub, even if that means the London delegates complain all the way to Birmingham. Speaking of which, we were at Birmingham for the HBAA conference (which as you’d expect got all the details right) in which we found out the cost of a hotel room outside the capital makes events that last longer than a single day much more cost effective when they happen in the regions (and here’s a list of average hotel prices around the world: – believe it or not, London is not in the top ten). Does Sydney count as a hub? Culturally more than geographically, perhaps. It is a profoundly international city with (unsurprisingly) a very strong Asian influence. And we mean ‘Asian’ and not ‘Chinese’: So Korea, Japan, Malaysia and India are all strongly represented in the city. Sydney city centre is easier and faster to reach from the airport than most other cities – and indeed from many of Sydney’s own suburbs, many of which are most easily accessed by ferry. A pretty journey, but not necessarily a fast or efficient journey. The schlep to and from Gatwick has put a crimp in many an excursion, though we welcome the overdue investment of £120 million for the line. Heathrow is better, but we remember one harrowing occasion on which the Heathrow Express was overtaken by the slower Heathrow Connect service into Paddington. Credit where it’s due – we got an immediate refund on the ticket. Sydney is 11 hours ahead, which from the British point of view puts it at a real advantage. In theory you can have a full day’s conference in Sydney before your London office has turned up on Monday morning. Or fly east across the International Date Line and catch the last of the weekend in a move that would have Doctor Who scratching his head and double-checking the control panel on the TARDIS. But the other attraction of Sydney has a sting: China’s economic boom has come at the price of air quality. And while Sydney makes much of their sunny weather, the real selling point is that it is far away from the smog that makes many industrial cities in the east impossible to explore without breathing apparatus. The catchment area is so vast that getting anywhere means getting on a plane, so you might as well be brave and keep going until you reach Sydney. Is the conference a chance to get away from it all or a chance to plug into a wider world? We’ve seen the bunker mentality of a countryside hideaway work wonders on a business problem, and witnessed a bar crawl around Manchester masquerade as ‘networking’. Is it important to be in a ‘landmark’ venue (such as Sydney Opera House) or would somewhere more anonymous serve your purposes better? Prestige can be a legitimate business need (we were particularly delighted to have our book launch in a venue as smart and stylish as King’s Place) but glamour can come at a price. Is the event entirely business focused or is the opportunity to break out and get involved in other activities important? We are thinking particularly of the falconry at Gleneagles, but you might prefer the kayaks at London’s Excel, or Park Lane’s proximity to Harrods. What is Plan B? The occasional North Atlantic volcano may put the kibosh on your best-laid plans once in a generation, but there are always strikes, engineering works, traffic jams and bad weather happening on a daily basis. Knowing more than one way to the venue may save your event. This article appears on Nadine Dereza’s website as well as PS Programmes. Nadine is the co-author of the best selling Insider Secrets of Public Speaking.